I blame the blossom. And then there’s the dust and the mould. What started as seasonal sneezing due to inhaling pesky pollen, motes of dried mud, and creeping black spores quickly led to sinus havoc. My ears popped crossing the mountains when I went to Goris. I was deaf, stuffed up and generating enough phlegm to allow fluent if fluid pronunciation of difficult Armenian double consonant sounds. By the time I came back it was showtime for three Irish pipers, playing badly in my chest. Now I have been diagnosed with bronchitis and confined to quarters, coughing. Elsa of course has no truck with my arguments against the environment. She knows I am ill because I won’t wear socks, will leave the house with wet hair, and don’t have enough warm clothes. She has now made socks mandatory. I am not allowed to wash my hair. I am too weak to argue. Elsa has very clear ideas about how to treat my illness, or indeed any illness. She feeds a cold and gorges everything else. 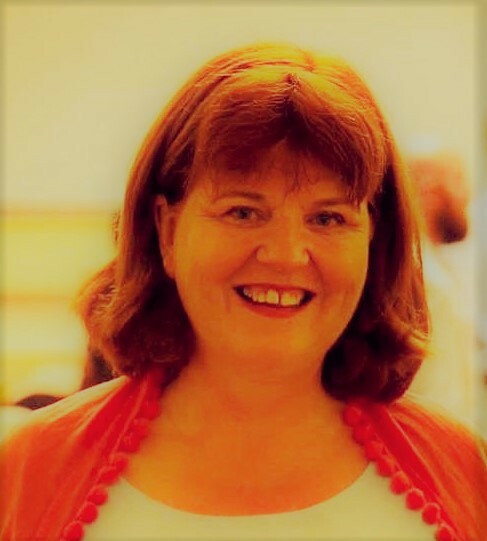 Things that are good for what ails me include: tea sweetened with black currant jam, vodka, (but only if swallowed from a shot glass in one large gulp), and butter–by itself is best but lavash can be permitted. The important thing is to get through half a pound at each sitting. If bread helps, so be it. Cherries, strawberries, and unripe small green plums eaten with salt (seed and all ) are also cure-alls. And of course there is spas. (SehPASS). 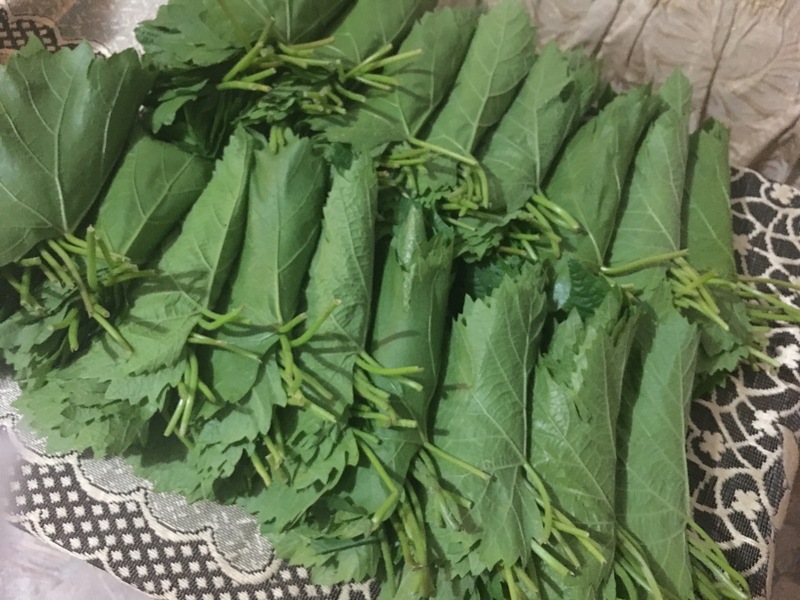 Spas is the Armenian equivalent of chicken noodle soup. It can cure anything. I asked Elsa to write down her recipe. She laughed and said I could watch her work. The prep is a speedy process so I was able to fit it in between bouts of coughing. I urge you to make some. It is definitely restorative. 2 heaped tablespoons of flour. Several handfuls of fresh dill, cilantro and tarragon, finely chopped with spring onions (use any other fresh herbs you like as well). The spring onions are key here– but you can be free form with everything else. Mix all the ingredients in a pan, beating in the flour and the egg so the liquid is smooth. Cook over a low heat, stirring occasionally until the barley is well swelled. About 40 minutes. Serve warm in a mug with a spoon. Add salt and pepper to taste. Get well soon. Between the vodka and the NyQuil (reccomended by the Peace Corps doctor), I spend a lot of time asleep, or at least speechless, glassy-eyed and immobile in a chair. I haven’t been to class since I returned from Goris and so I am at home during the business of the day. I watch Indian soap operas and American films, all dubbed in Armenian. (I saw Brad Pitt and Ashton Kutcher in something yesterday. Or was that just the drugs?) Elsa is usually working– hens to tend to, sticks to break and stack, weeds to pull, floors to clean–but sometimes she finds a task she can fit in while visiting the sick. 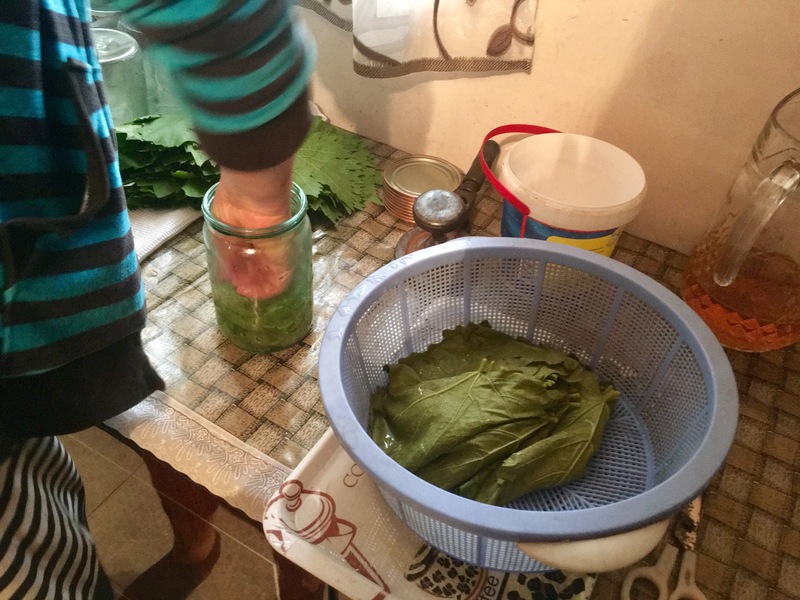 Yesterday it was canning vine leaves in preparation for dolma demand this winter. 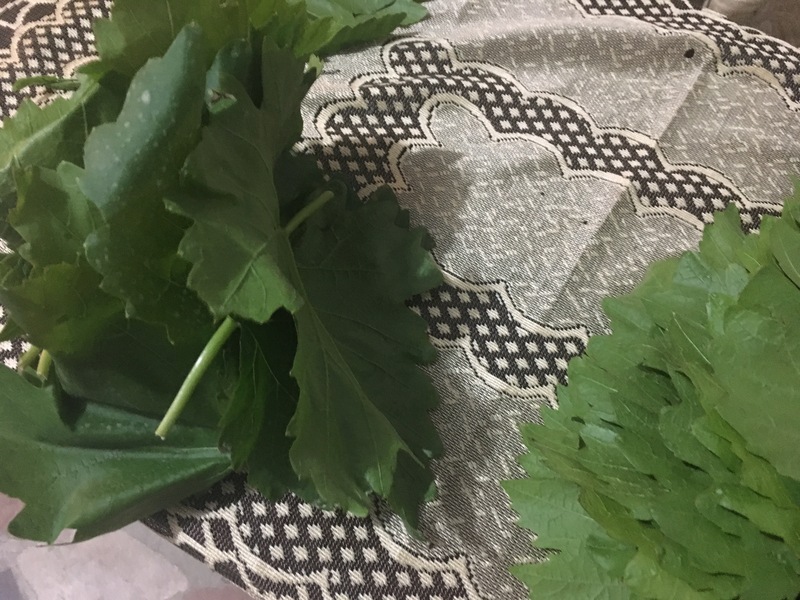 As high drama played out on TV (someone in a sari has been kidnapped) Elsa created neat piles of about a dozen grape leaves each, smoothing each leaf as though it was filmy, fragile lingerie she was preparing to pack. Then she gently laid each pile in a colander over a pan of boiling water and covered the pan to steam the rosette. 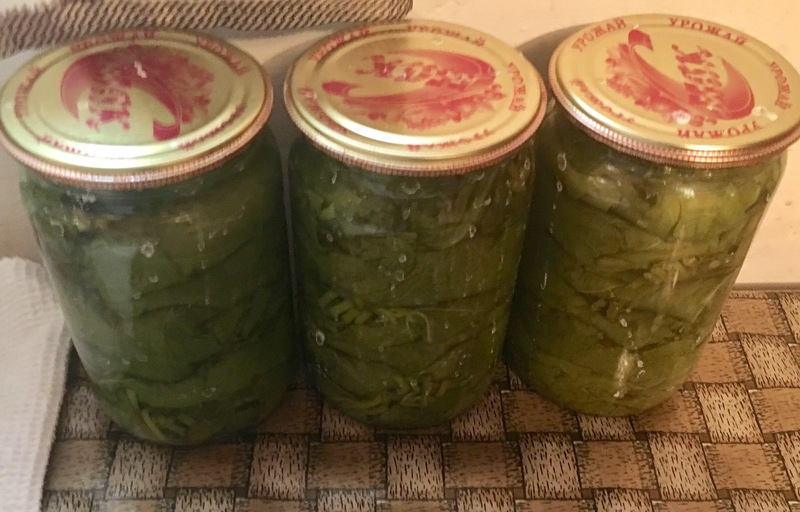 She then folded and tamped the batches of softened leaves into mason jars and sealed them tight. This was the first crop of this year to make it to the pantry shelves. Neighbors are in and out all day. Tamara brought me cherries and strawberries from her garden because she heard I had the grippe. “Butter” she said as she heard me speak “Butter’s what you need for a sore throat.” Sada came and sat for a bit and put a rug round my shoulders. “Stay warm” she said. “You need more clothes.” She hugged me when she left “Butter” she said “Plenty of butter.” Like Elsa, both these women are the same age as me. They must wonder how Americans survive past childhood when we are so ignorant of basic wellness techniques. Right now, Elsa is boiling me an egg, laid by one of our hens this morning. It will be perfectly cooked, the bright yolk just set and no suggestion of a tired, grey outer ring. She will peel the egg straight from the pan–her fingers are asbestos. She will mash the egg on a small plate with salt and pepper and maybe a side of herbs. Before she gives it to me she will add a slab of butter. “Kerr, Kerr” she will say. “Eat, Eat.” Let’s hope the cough goes before my heart gives out. 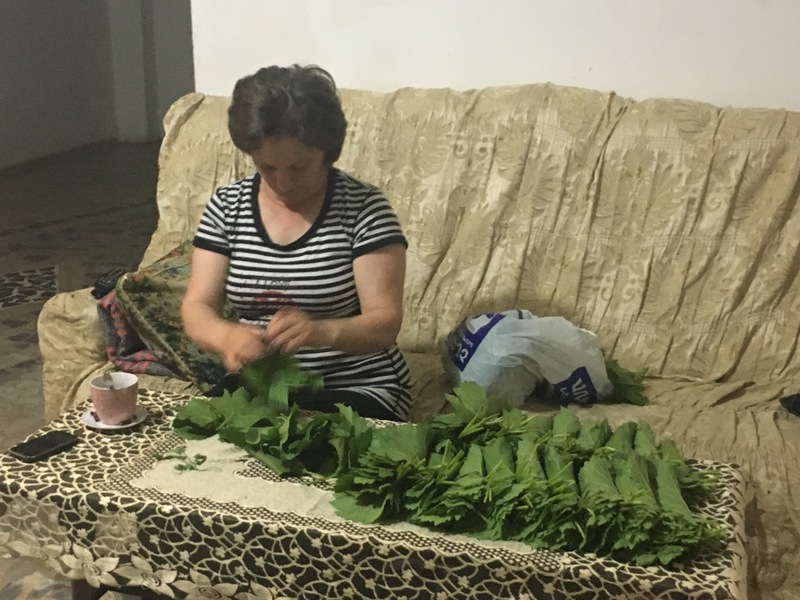 This entry was posted in America, Armenia, Bronchitis, Cooking, Cross-cultural understanding, family, Food, friendship, travel, Village life, Vodka, Women. Bookmark the permalink.